Paul Mattick Sr.'s 1939 review, from Living Marxism, of Karl Korsch' biography simply titled Karl Marx, first published in English in 1938. Mattick finds the biography largely relevant to proletarian revolution, yet critiques Korsch for his misreading of Lenin. In conspicuous distinction to many other interpretations of Marx, this book concentrates upon the essentials of Marxian theory and practice. The author restates “the most important principles and contents of Marx’s social science in the light of recent historical events and of the new theoretical needs which have arisen under the impact of those events.” The book is not out to please the curious, nor does it correspond to any particular group interest. Because in its compactness and objectivity the book is a useful theoretical tool for proletarian class aspirations, we cannot in reviewing it do better than to indicate, though inadequately, its richness and value. The book is divided into three parts: Society, Political Economy, and History. Marxism is declared “the genuine social science of our time,” and its superiority to the pseudo-social science of the bourgeoisie is demonstrated throughout the book. Of the greatest importance to the comprehension of social phenomena, the author points out, is the grasp of Marx’s principle of historic specification. Marx dealt with all economic, social and ideological concepts “only insofar as it is necessary for his main theme, i.e., the specific character assumed by them in modern bourgeois society.” The so-called ‘general ideas’ must always have a specific historical element. For instance, the false idealistic concept of evolution as applied by bourgeois social theorists “is closed on both sides, and in all past and future forms of society it rediscovers only itself. The Marxian principle of development is, instead, open on both sides. Marx defines the new communist society arising out of the proletarian revolution not only as further developed forms of bourgeois society, but as a new type which is no longer to be basically explained under any of the bourgeois categories.” How necessary it is, and especially today, to restate this Marxian position becomes clear if only when we consider the recent literature on socialism which envisions the socialist society as a modified form of capitalism, and, under different names, transfers all capitalistic categories into the ‘new’ society. We think the finest chapters in the book are those devoted to the Fetishism of Commodities and the Law of Value. The author shows anew that, “The most general ideas and principles of Political Economy are mere fetishes disguising actual social relations, prevailing between individuals and classes within a definite historical epoch of the socio-economic formation,” and he points out further that the theoretical exposure of the fetishistic character of commodities is “not only the kernel of the Marxian Critique of Political Economy, but at the same time the quintessence of the economic theory of capital and the most explicit and most exact definition of the theoretical and historical standpoint of the whole materialistic science of society.” These chapters are so masterfully concentrated without thereby losing clarity that they make feeble any attempt at restatement. The thoughts cannot be couched in more terse and more effective language and we can only restrict ourselves to the statement that the author sees the task of the revolutionary proletariat as “the ultimate destruction of capitalist commodity fetishism by a direct social organization of labor.” The meaning of the present social organization of labor, which is hidden under the apparent value relations of commodities, is demonstrated with reference to the present illusionary capitalistic “planning” attempts, which can only still further disrupt the “order” that is peculiar to capitalism and that was brought about by the blind necessities of a fetishistic law of value. The latter part of the book deals with the materialistic conception of history. Though it has a philosophical origin, Korsch points out that Marx’s materialistic science, “being a strictly empirical investigation into definite historical forms of society, does not need a philosophical support.” Tracing the scientific development of Marx, he shows, “As early as 1843 it had become clear to Marx that Political Economy was the keystone of all social science.” In place of the time-less development of the “idea,” Marx put the real historical development of society on the basis of the development of its material mode of production. In a chapter dealing with the relation between Nature and Society, Korsch shows that, “As with all other innovations embodied in the new materialistic theory, Marx’s methodical extension of society at the expense of nature is proved mainly on the field of economic science.” After clarifying a number of Marxian concepts such as the relation between productive forces and productive relations, basis and superstructure of society, Korsch explains what Marx meant in saying that, “The real historical barrier of capitalistic production is capital itself,” and that only the proletarian revolution, by changing the production relations, can secure the further progressive development of the social forces of production. But although we agree in such large measure with this interpretation of Marx, we cannot abstain from remarking that its great clarity and revolutionary consistency in dealing with Marx is somewhat dimmed as soon as it deals with more recent revolutionary events and their characters. For instance, the shift of emphasis between the earlier and the later formulations of the materialistic principles by Marx, from the subjective factor of revolutionary class war to its underlying objective development is, in Korsch’s interpretation, caused by actual developments enforcing a change of attitude. “In a similar manner,” he says, “the revolutionary Marxist, Lenin, came to grips with the activistic revolutionary tendencies of the left Communists of 1920 who in an objectively changed situation adhered to the slogans of the direct revolutionary situation released by the Great War.” This belated defense of Lenin’s opportunistic and rather silly pamphlet Left-Wing Communism, an Infantile Disorder, which was designed to secure Russian control over the international labor movement in the specific interest of Russia and its Bolshevik Party, cannot change the fact that Lenin’s “turn of face” was not the result of a sober consideration of a changed situation, but was no change of face at all. 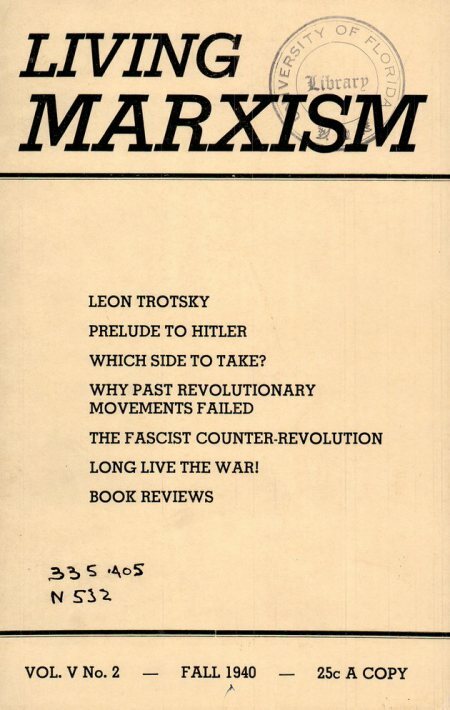 This pamphlet of Lenin’s maintained the position he always had against the revolutionary opposition of parts of the proletariat of Western Europe. This position was his also during the time, which, according to Korsch, was objectively revolutionary. It was the position of the social-democracy of pre-war times, which Lenin never left mentally but only organizationally. It was interwoven with the position of the Russian bourgeois revolutionist and was in strict opposition to all specific revolutionary principles of the working class before, during, and after the Great War. It was in strict opposition, too, to those Marxian principles, forgotten by both the Socialists and Bolsheviks and which, restated here, makes this work, whether its author likes it or not, a weapon against the “Marxist” Lenin.